While awareness of social issues in the coffee supply chain and other industries continues to grow, we still have a long way to go when it comes to addressing labor issues in producing countries. 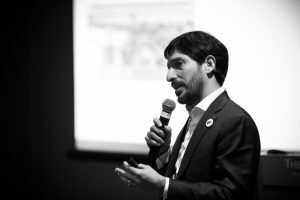 This was the topic of several sessions led by Miguel Zamora, Director of Markets Transformation at the Rainforest Alliance, at this year’s National Coffee Association (NCA) conference in Atlanta, United States. Together with major coffee companies, NGOs and other coffee stakeholders, we had the chance to discuss one of the most significant priorities for the coffee industry: the importance of a strong approach to labor issues at origin and the benefits of pre-competitive collective action. Read on as Miguel shares his experience and takeaways from this year’s event. The coffee industry depends on the labor of millions of transient workers who arrive on coffee farms all over the world during the harvest to pick coffee. Labor represents the largest cost of production for coffee farming. Despite the fact that farmers represent millions of people and are key to coffee production, the coffee industry and related stakeholders still do not understand their situation, challenges and opportunities well enough. Coffee farmers, especially smallholder farmers, face many challenges, including poverty, commodity price fluctuations, and increasingly erratic rainfall patterns caused by climate change. Coffee farming is hard (manual) work that often involves carrying heavy loads on steep slopes. The industry depends on seasonal workers who travel a long way from home and often stay in poor quality housing. Many workers receive low wages, have limited legal protection, and no or limited access to pensions, paid holidays or insurance. These are just some of the issues that stakeholders at the conference, including the Rainforest Alliance, came together to better understand and address. Beyond the need to tackle labor issues from a human rights point of view, the risk of not addressing them is now mounting from a business accountability perspective as well. Lately, we have seen a surge of interest from governments around the issue of labor, with increasing legislation targeting procurement practices and forced labor, including child labor. This is in line with research that shows most consumers (including coffee consumers) are aware and care about human rights issues in the products they purchase – choosing or avoiding brands according to their commitment to human rights and other supply chain impacts. These developments present an opportunity for the coffee industry to improve the sustainability of their supply chains – managing compliance and brand risk – while reducing the risk of labor abuses in coffee farming and improving the well-being of farmers, workers, families and communities. One of the key takeaways from the conference was the importance of social compliance systems. A social compliance system is an integrated set of policies and practices that a company uses to maximize compliance with a code of conduct that covers social and labor issues. It helps to monitor, prevent and remediate the potential presence of labor abuses in coffee, including forced labor. 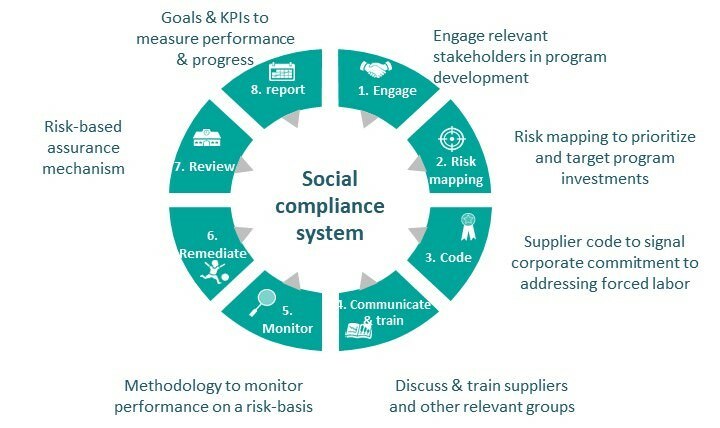 An integrated social compliance system includes engaging stakeholders and partners, assessing risks and impacts, developing a code of conduct, communicating and training across the supply chain, monitoring compliance, remediating violations, independent reviews and reporting performance. While they bring significant benefits, social compliance systems can be very resource-intensive and cumbersome for one company to manage alone. That’s why they function most effectively when many coffee stakeholders develop and use them collectively. When coffee companies work together and collaborate with NGOs working at origin, we can have access to better information and knowledge as well as a stronger voice with governments and policy makers around the world. Pooling our resources and systems can create better conditions and lower risk that benefits farmers and everyone across the supply chain, reduces risk for brands, and improves compliance, all while lowering costs. This is the shared opportunity we have ahead of us as a coffee industry. How can you get involved and start benefiting? There are many opportunities for companies to drive towards improved labor issues in the coffee sector, including initiatives such as the Sustainable Coffee Challenge, or by joining our Alliance, both by achieving Rainforest Alliance or UTZ Certification and helping us to improve our agricultural certification standard, which is currently under revision. We are dedicated to finding ways to work collectively within the industry to eradicate forced labor and improve labor conditions. By working with the Rainforest Alliance, you are joining this cause, along with hundreds of other coffee businesses around the world who already work with us. This can benefit your company, from a branding, reputation and regulatory perspective.